Do you feel like you’re stuck in a rut, but your mind is full of ideas and wishes for the future? Learn these easy techniques to get what you really want easier and fasterWe usually search for happiness without looking into what really makes us happy, how to formulate our wishes effectively and how to act in order to accomplish them. Following the basic rules of the law of attraction, we can get what we want and acquire results quickly. I n order to arrive somewhere, we need to choose a destination!. If you haven’t decided on one, then all destinations seem to be right. It is the same in deciding what makes us happy. If you don’t know what makes you happy or what would make a great difference for you right now, then, whatever happens, you will find satisfactory. As that is not the case, and you probably don’t find everything to be positive for you, it is important to decide what you want. Different people have different desires. Just because your friend would like to have a new car doesn’t mean that the same thing will make you happy. What is happiness for one can be a misery for another one. Therefore, think what is important for you to achieve or change at this point whether it is an ideal house, new phone, job, significant other, new friends, a certain destination that you would like to visit, etc. Or, perhaps you would like to be more confident, optimistic, calm, relaxed, etc. When you decide what you want, be specific about it. The reason people don’t achieve what they want is because they do not specify their goals. To get what you want, it is essential to list details that are important to you. It is good to set a goal such as to have a bigger house. However, I am sure you wouldn’t just want any house, in a bad neighborhood or in bad shape. That’s why it’s important to describe your ideal house in as much detail as possible. Similarly, as much as you may like to have a significant other at this point, I am sure you wouldn’t settle just for anyone. You certainly wouldn’t like the other person to be abusive. Some people would like their significant other to be at home a lot, others enjoy a more outgoing personality. Therefore, be specific about characteristics you consider important for your significant other to have. It is important to set your goals in a positive way! That way, you give attention to what you want to achieve. A good example is: I have a beautiful, big house in the suburbs of the city, with four bedrooms, big garden, etc. This way you focus on your ideal state. Abad example is: I want to lose weight. The second example is bad because you are focusing on something that has a negative association for you. Also, you are focusing on losing instead of gaining something. In order to reverse this, formulate a goal with attention to a positive state for you, such as I have a fit body. The winning formula is to focus on something you want, not what you don’t want. Believe that you can have it, and you shall have it! The goal has to be attainable from your perspective. It’s not what is realistic in your country or for your friends, neighbors, but what you think is possible! In general, every goal can become a reality. If a human being has done it before, it is possible for anybody to achieve that same thing. There are no limits. If you know of somebody who has the job that you want (I mean anybody in the world; people you know personally or saw on TV), it means that it is possible for you to have it, too. However, you have to believe it. If you think that you are too old, don’t have right education or are too shy to achieve that ideal job, house, relationship, etc., then your reality will confirm that. You will not achieve your goal because of the reasons you’ve listed for yourself. If your goal is to be more confident, act like it, even if you don’t feel it yet. Think how a confident person walks or talks. What would they wear? How would they act in this or that situation? Then, act like that. If you know such person already, impersonate them. The law of attraction doesn’t know if you are acting, remembering or daydreaming. It only responds to your emotions right now. Therefore, act as if you have already achieved your goal, and the law of attraction will provide you that. 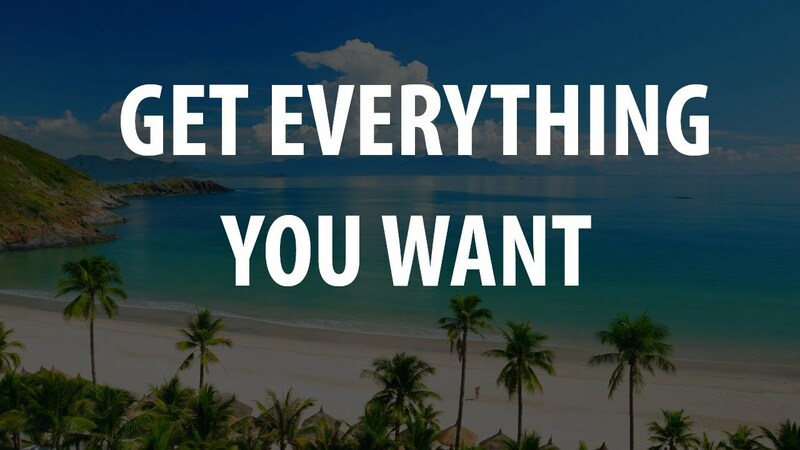 A very important ingredient of getting what you want is to let it happen. Your task is to ask, but how it happens is not of your concern. It is like ordering a meal in a restaurant. You have chosen your order. A chef will make it and a waiter will bring the order to you. You don’t have to question if the pasta is boiled right. You certainly do not go into the kitchen to check how much salt was added. You sit and talk with your friends until your order arrives. If you are stressed about your goal and constantly think that you need it now, or question whether or not it will come true, you doubt. The emotions you send are the ones that you will get back. You will question more and doubt more. That’s why the important element is to allow the universe to bring what you asked for like in a restaurant. We achieve our goals faster if we are calm and relaxed about because it shows that we believe it will happen. How do you achieve your goals? What methods do you like to use? Aleksandra Plazinic holds a Ph.D. in Strategic Communications. She is an optimist, life-long learner, with a passion for communications. She lived in 5 different countries and 5 languages. Aleksandra shares effective communications tools for happiness and success at www.aplazinic.com and she is always on a quest to find new methods that enrich personal and professional skills.